The ‘Leave’ outcome of the UK’s referendum on EU membership was in part shaped by issues surrounding today’s labour market inequality, and the actual exit will have implications for inequality in the future. In this chapter we discuss both of these, first showing some evidence that the spatial distribution of Leave votes was correlated with low and stagnating real wage levels, and second considering some key areas of relevance of the vote outcome for aspects of wage inequality. Figure 1 shows the first of these, plotting the percentage voting Leave in the referendum against the median weekly wage in local authorities in England, Scotland and Wales. The pattern shown by the figure is not surprising, but it makes it evident that areas with relatively low median wages were substantially more likely to vote to Leave. A negative pattern also arises for wage growth since 1997 – real wages fell over this time in 62 out of 370 local authorities. It is evident that, in general, worsening economic conditions for workers have proven important in shaping moves in voting behaviour away from the main political parties for quite some time, and very markedly in the Leave vote in the referendum. 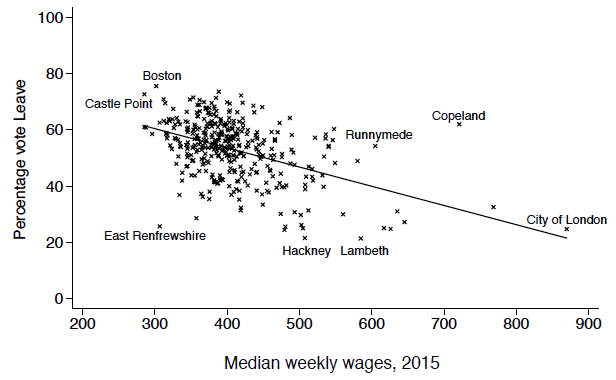 Notes: Median weekly wages at local authority level from the Annual Survey of Hours and Earnings. Given the referendum outcome, what are the likely implications for wages in the future? In the short run, the slowdown in growth is likely to put downward pressure on wages. The another, longer-term factor will be the negative trade shock from leaving the union – as highlighted in the pre-referendum economic research (e.g. Dhingra et al. 2016). Finally, reduced migration and capital flows are likely to impact the structure of wages. We start with the trade shock. The trade shock is likely to hit wages and income hardest in the places where globalisation has already had an impact, namely, the manufacturing sectors. These sectors have been losing out because of cheaper imports, especially from China (Bloom et al. 2016) and this suggests that they are especially vulnerable to trade shocks. There is, however, a ray of hope for manufacturing exporters that stems from the competitiveness-enhancing impact of sterling’s lower value. On balance, however, it does seem that the old industrial heartlands – who ironically voted for the most part for Brexit – will be where downward pressures may well be more pronounced. Reductions in migration, if they do occur, are likely to manifest themselves in at least two ways. First, there is the question of EU students attending universities. Reductions in these numbers may well have ramifications for the future supply of graduates entering the labour market. Second, at the bottom end of the labour market the UK has been increasingly reliant over time – especially since the EU’s eastern enlargement in 2004 – on migrant workers to perform minimum wage jobs. If this supply falls, then there may be pressure to raise the national minimum wage. The City of London’s finance operations are also likely to face a negative shock. It seems unlikely that our EU partners will grant full access to the Single Market without the UK agreeing to completely free movement of labour. Since this has seemingly already been ruled out by the UK government, there is likely to be a trade-off between access and labour mobility. The ability of financial services firms to passport their services across the EU will surely be at least partially removed. This is likely to reduce employment in finance, particularly in London. While this may entail costs to the economy and tax base, it might well reduce income inequality given how dominant the City is at the very top end of the income scale (Bell and Van Reenen 2013). Both the structure of wages and the strength/weakness of wage growth will likely change in response to the UK leaving the EU. Here we have identified some factors that may exacerbate already existing wage inequalities, and some that may reduce them. What is clear is that the labour market will need to learn to operate in a different way than previously in response to Brexit, and that the consequences of this adaptation will alter the structure of wages in ways that will need to carefully monitored and studied in due course. Bell, B. and J. Van Reenen (2013), “Extreme Wage Inequality: Pay at the Very Top”, American Economic Review 103: 153-57. Bloom, N., M. Draca and J. Van Reenen (2016), “Trade Induced Technical Change: The Impact of Chinese Important on Innovation, IT and Productivity”, Review of Economic Studies 83: 87-117.